In a recent study by EF Education First (www.ef.com.es/epi), the English level of Spaniards was ranked 17th out of 19 European countries, representing 92% of the total European population excluding the UK and Ireland. Only Russia and Turkey obtain worse results than Spain in the ranking. The graph below shows those 19 countries, given their gross domestic product (GDP) at PPP per capita and their level of English, as measured by the EF EPI index. As you can probably guess, Spain is the red diamond. 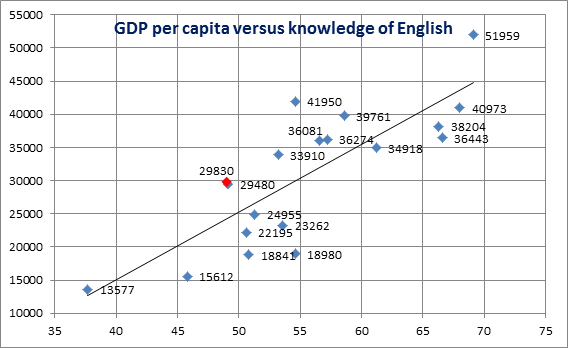 There is a strong positive correlation between level of English and GDP per capita. English level of countries to the left of the diagonal line, including Spain, is worse than what the GDP of the country would suggest. Three years ago, the Spanish prime minister, Mr. Rodríguez Zapatero, announced a plan aimed at reaching an ambitious goal: “in ten years, Spaniards leaving high school will speak fluent English,” he solemnly asserted. But reality is quite stubborn and gives today plenty of anecdotal evidence that this will not be quite the case. If you have visited or lived in Spain and tried to communicate in English in the street (no matter the age, old or young,) you know what I am talking about. It is true that an effort is being done in private and public schools to put a remedy to this situation. A small, but increasingly portion of curricular time is already taught in English, and bilingual education is little by little gaining momentum in many schools. However, a huge problem to implement this plan is that there are not enough native teachers to teach English, thus students do not learn how to speak. Try this: tell a 12-year-old good student to recite a list containing fifty irregular verbs (eat-ate-eaten and the like.) He or she will do it by heart, but will be incapable of correctly pronounce half of them. Let us face it: non-native teachers in Spain do not devote enough time to conversation in class (my group is too large is the usual excuse) and, even if they do, they lack the appropriate phonetics skills; even many of them speak English with an (often strong) Spanish accent. In the business space, this unfilled educational gap leads to a clear situation of competitive disadvantage when Spanish firms try to compete with other firms in the international arena. It is not a coincidence that Spanish multinationals sell much more in Latin America than its European counterparts, who mainly sell in Europe, a much more natural market in terms of geographic distance. There is a huge language barrier, another one to add to the long list of Spanish barriers to achieve competitiveness. How to break this vicious circle of low-skilled teachers and low-skilled students without spending enormous amounts of money on élite schools or “imported” teachers? Second, the curriculum in schools has to be turned upside down. Start teaching only oral English in elementary school. Use cartoons, movies, and the internet to expose kids to native English. Start teaching writing skills to sixth or seventh graders, when they are ready to absorb grammar easily. Finally, prevent students from digressing too much by learning other languages, such as German, or Italian, or French. Unless they have a clear vocation towards languages, English will be the only one they will most likely need at work. It is better to speak fluent English than intermediate German, English, Italian, and French. Following these simple guidelines, in fifteen years, teenagers will have acquired the speaking skills that they lack today. The solution is not that original; see what the blue diamonds in the top-right part of the chart above (Norway, Denmark, Belgium, The Netherlands) have been doing for many years. These are my two cents; it seems to me like a simple recipe for success. It is going to take a while, so the sooner they start, the better.